Ryan’s entrepreneurial path was born in his family owned hardware business in Vermont. His exposure to the challenges of small town business at an early age fueled a desire to bring local products to a global market. 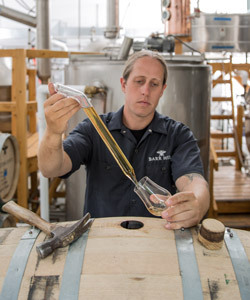 Ryan spent 8 years as an avid brewer and owner of a home-brewing store, which eventually led him down a path to distilling. In 2011, Ryan met a beekeeper named Todd Hardie. Todd had been keeping bees for 30 years, and was on a pursuit to bring the agricultural aspect of beekeeping into distillation. Ryan, captivated by Todd’s agricultural mission, sold his home brewing business to step foot into the distilling arena. With a 15 gallon still, and a Mercury station wagon, the beekeeper and the distiller built the Caledonia Spirits distillery, and set out to share their beloved Barr Hill Gin with the world. Today, Barr Hill is distributed to 32 US States, and exported to 5 countries. The appreciated gin has celebrated 12 gold medals and top honors in New York, San Francisco, Berlin, Hong Kong and many more. In 6 years in market, Barr Hill has become the nation’s fastest growing domestically produced super premium gin. Join Ryan as he shares stories of the global history of gin, guides us on a sensory evaluation, and provides insight on the modern day movement that’s fueling the modern day gin revival.